Group assignments are very common both in the professional organizations and educational institutions. Working in teams and groups are known to bring about synergies of results and better performance in all aspects. It is therefore always promoted that people work in groups and teams. There are several benefits of group assignments like improved efficiency and effectiveness, self-accountability within the team, skills of different people come together and work burden is divided. But along with the pros, there are also some problems while working on group projects and assignments. These drawbacks may include conflict of personalities, inability to coordinate, the inability of socializing, conflict of interests and many other such problems. Therefore while working in group assignments it is always advised that you should be fully prepared and organized. This will require you to use a group assignment to do list template. This is a very informative and useful document that helps the participants of a group to know exactly what they are supposed to deliver. The template should contain the names of all the members along with the specific tasks that are assigned to them. It also requires that you mention the time and resources allocated to the task so that this document can help track the progress of the project as well. 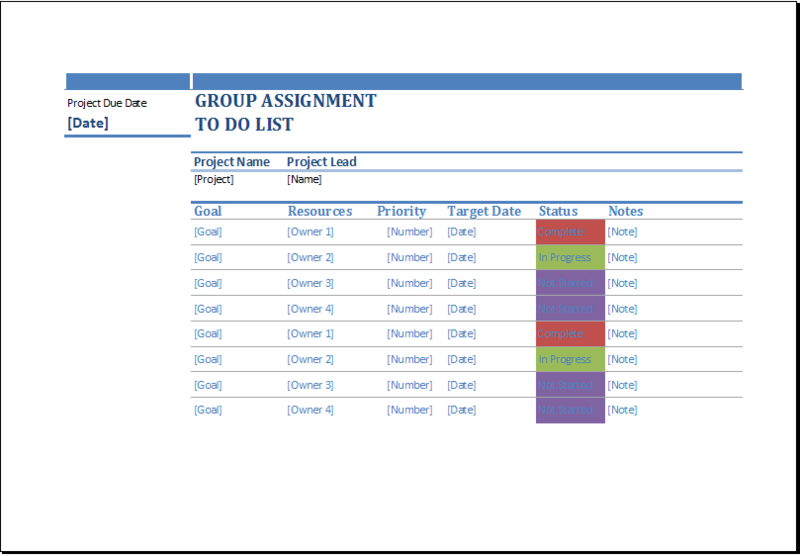 The group assignment to do list template can make working in a group much more convenient and comfortable for all the members. It is beautifully designed to serve the purpose. Mention project due date and assign duties to all concerned individuals. keep track if the work is being completed on time.